A couple years ago a friend bought some mocha granola at a weekend farmer's market (from a, no doubt, certified mocha granola farmer). I choked on the ten dollar per bag price. Searching around the internet yielded a number of recipes, none of which completely appealed to me. 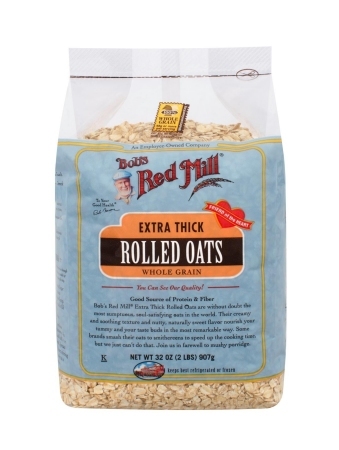 I don't like excessively sweet tasting foods and most seemed to be more like candy or gorp than a breakfast cereal. I took what were to me the most appetizing ingredients, played with various combinations and quantities and finally evolved the following recipe. 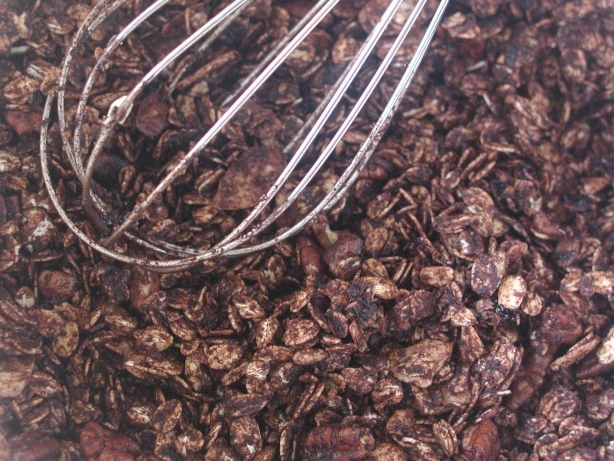 This recipe produces a basic chewy, easy pouring, non-clumped style of granola similar to a muesli except with flavor. 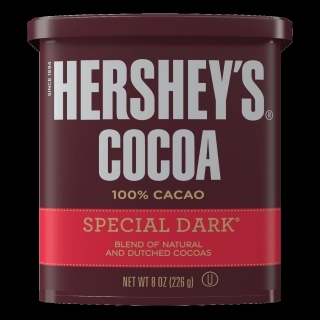 It can be used as a topping, by itself with milk as a breakfast cereal or eaten dry out of the bag. The recipe below may look a bit complicated in print but really takes only a few minutes to prepare. Feedback has been that this concoction leads to dependence and tolerance, two of the physiologic criteria for addiction. 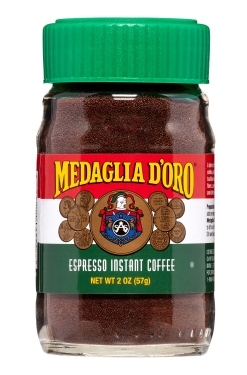 NOTE: Trader Joe's has every necessary ingredient, except the espresso powder and recommended cocoa. 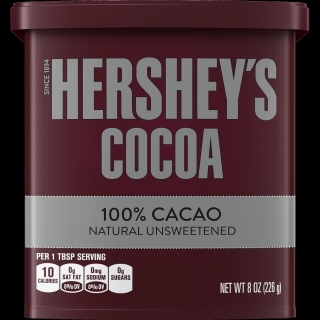 You're going to make three separate mixtures: The oats/nuts mixture , the cocoa/sugar mixture and the oil/vanilla mixture . 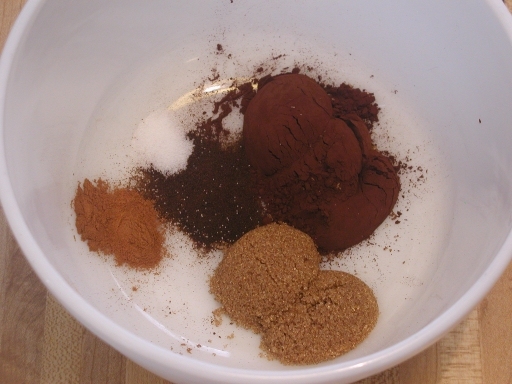 Then, all three will be combined prior to baking. 4. 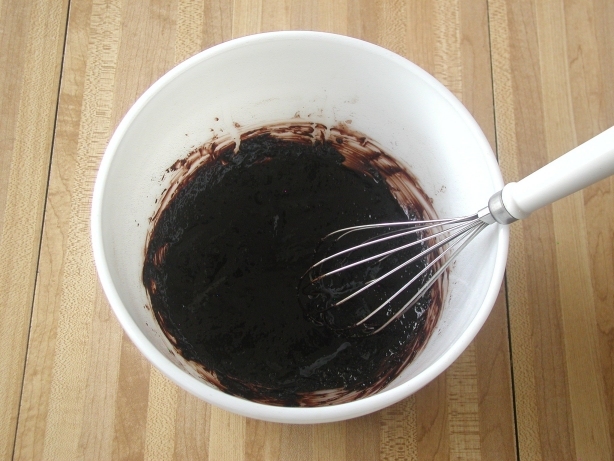 Add the oil/vanilla mixture to the cocoa mixture in the large mixing bowl and whisk thoroughly, creating a paste. 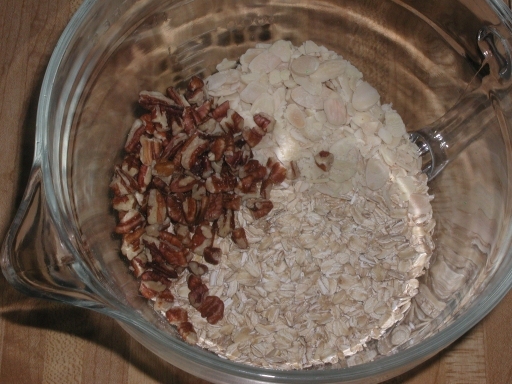 If using coconut oil you may need to slightly remelt this mixture before adding the oats/nuts. 6. 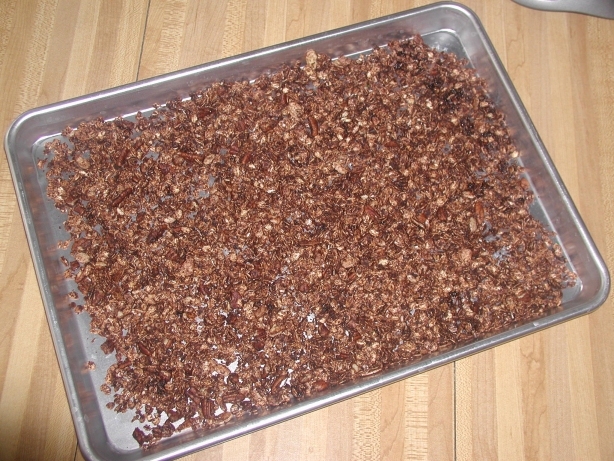 Spread the uncooked granola mixture evenly on a rimmed baking (cookie) sheet. 7. Preheat the oven to 325 degrees and bake the granola for 10 minutes on an upper rack, then turn/stir (using a non-slotted metal spatula is easiest) and bake another 10 minutes. 8. 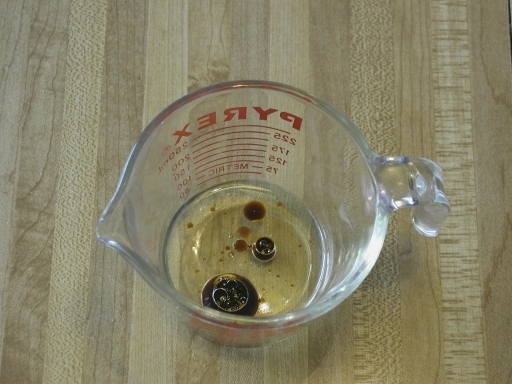 Remove from the oven promptly (it burns easily), stir it again and set aside to cool. 9. Store in a cool/dry place or the refrigerator. I'm under orders not to tamper with the recipe as it is. However, it might be interesting to try adding shaved coconut, dried blueberries or some other fruit, or substituting cashew pieces for the almonds or pecans. I hope this information is useful. Any constructive comments or suggestions would be welcomed. This page uses the optional Paddington font.